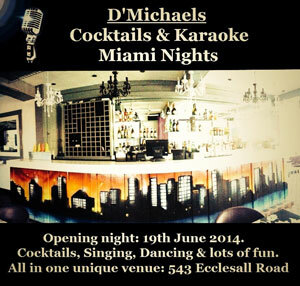 D'Michael's is located at the top of the vibrant area of Ecclesall Road, and is a Miami style Bar and Restaurant. There are a wide range of drinks on offer and includes an extensive selection of cocktails, wine, champagne, draught and bottled beers. DJ Friday and Saturday nights. After Ascot Ladies Day D’Michaels are opening their Cocktail and Karaoke night on the 19th June. This event will then be on going, every Thursday evening. Cocktails and Karaoke event, is a great way to build confidence in front of a crowd, practice your vocals but most importantly have a fun time with friends. We offer double power sockets for all and free WIFI. 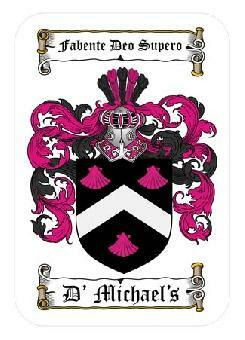 D'Michaels brings Miami to Sheffield. This fantastic and unique bar is known for its super service and welcoming atmosphere. We can guarantee entertaining and enjoyable night whilst indulging on the best cocktails around.